Posted on April 24, 2017 by Emily Summars. The national weather radar system used throughout the United States by NOAA National Weather Service forecasters to “see” weather across the country is unique because it can be upgraded and modified with the newest capabilities, unlike other systems worldwide. Because of this, and the need to work with experts in radar signal processing for improving the quality of radar data, international partners from the United Kingdom Met Office are collaborating with researchers from The University of Oklahoma Cooperative Institute for Mesoscale Meteorological Studies at the NOAA National Severe Storms Laboratory to develop new techniques for U.K.-based radars. 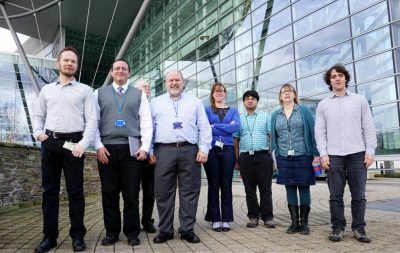 NSSL and CIMMS researchers Sebastian Torres and David Warde (second and third person from the left) visited the UK Met Office in Exeter from February 22-26, 2016 to support implementation of CLEAN-AP on the UK weather radar network. The U.K. Met Office decided to build its own signal processor for their radar systems. This allows a similar degree of flexibility to that of the NEXRAD radars, also known as the WSR-88D (weather surveillance radar-88 Doppler), operated in the United States. NOAA offered some of its tested techniques to the U.K. Met Office and in return received access to valuable data it could use for future research and operations. Inside every NEXRAD radar is a rotating parabolic antenna. As the antenna rotates, it travels up and around while sending out pulses of electromagnetic energy. When radars send and receive these pulses, buildings and other structures may obstruct the radar’s view, contaminating the storm data. To help keep unwanted objects from impacting storm data, Torres and fellow CIMMS Researcher David Warde developed two complementary signal-processing techniques for the WSR-88D. One technique, called CLEAN-AP, or Clutter Environment Analysis using Adaptive Processing filter, removes unwanted radar echoes from objects on the ground. The other one, called WET or Weather Environment Thresholding, intelligently decides when the CLEAN-AP filter should be applied. This prevents slow-moving storms from being confused with stationary objects. “The goal of CLEAN-AP and WET is to clean the data as much as possible so the forecasters have the best data available to make warnings and forecasts,” Torres said. 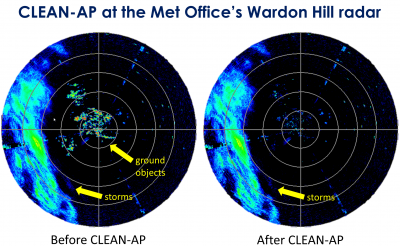 Through collaboration with the U.K. Met Office, who implemented CLEAN-AP and WET, the techniques were fine-tuned and improved. Both techniques are being transferred to the NOAA National Weather Service, and CLEAN-AP is licensed by OU to U.S. weather radar manufacturer Baron. Another CIMMS Researcher, Igor Ivic, developed a third product transferred to the U.K. called the Radial-by-Radial Noise Estimator. RBRN improves the quality of radar data by removing “noise,” the radar equivalent of radio static or television static. It was implemented on the U.S. NEXRAD network as part of ongoing research-to-operations efforts at NSSL and CIMMS. “If you have noise and you can remove it from the radar returns, then you get just the signal, and that can be used to get better quality data,” Torres said. Torres called the collaboration a “win-win” situation because the information exchange, as well as the new technologies and techniques that have been developed are good for both the U.S. and U.K.